It's been three years since Montreal's The Dears released their somewhat lackluster album Missiles. 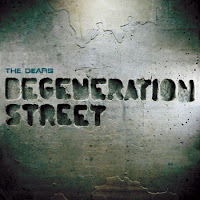 On February 15th the band returns with the fifth proper full length, Degeneration Street. Will it mark a return to form? Keep reading to find out. There's no mistaking it, this is undoubtedly a Dears record. The songs are moody yet stylish. There's the familiar dark cloud that hovers above nearly all of the tracks (the uncharacteristically sunny "Easy Suffering" being the lone exception). The band does their sound very well. In this case, tracks like "Lamentation" and "Tiny Man" (which oozes soul), rank right up there with the best of The Dears' catalogue. After a while though, the album does begin to sound formulaic. You know the song will start slowly and quietly. Eventually it will burst out and end with Murray Lightburn singing his lungs out. Stop. Repeat. The album's highlights definitely come when they take some risks and introduce new concepts. The jangly "Yesteryear", for example, is extremely refreshing. The propulsive rock of "Stick w/ Me Kid" also strikes a chord. "1854" begins as many of these songs do, but transitions into a near clap-along. 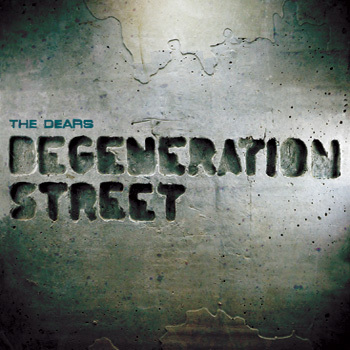 Checking in with 14 tracks, Degeneration Street could use some editing. Chopping off two or three cuts would've tightened the package up nicely and given the fans a solid record from start to finish. As it stands, the album still has it's great moments, but you do have to sift through some chaff to find them. Best tracks: "Stick w/ Me Kid", "Tiny Man"
Pretty much, get rid of Tiny Man and the last title track and they've got a 10/10 record.